How can we expect righteousness to prevail when there is hardly anyone willing to give himself up individually to a righteous cause. Such a fine, sunny day, and I have to go, but what does my death matter, if through us thousands of people are awakened and stirred to action? On the day we visited the campus, a group was rehearsing for a night of readings and music in honor of the White Rose students. This entry was posted on June 24, 2012 at 3:03 pm	and is filed under * A FLOOD OF EVIL ... Lew's novel-in-progress. 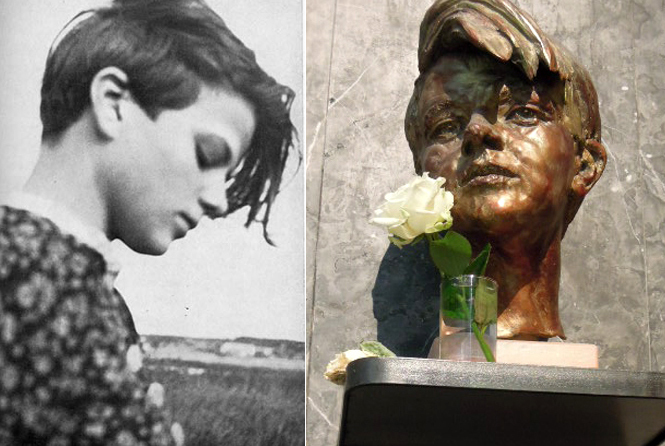 Tagged: resistance to Nazis, Sophie Scholl, White Rose. You can follow any responses to this entry through the RSS 2.0 feed. You can skip to the end and leave a response. Pinging is currently not allowed. Sophie Scholl’s last words gave me chills (actual, real chills). Imagine the courage and conviction it takes to stand by your beliefs even knowing that you’re going to die for them – and having the presence of mind to say something so clear, so succinct. Human history like this makes me feel very fortunate to have been born into a time and place where I will not be killed for my beliefs, and because of the sheer luck of being born here in Canada, it would be easy to forget that in other parts of the world, people like Sophie are still being killed for voicing their beliefs. Nazi Germany may be no more, but the mindset to kill those who oppose you because of their differing beliefs, practices, skin-colour etc. is still very much alive and kicking. When I read about young women being stoned to death for talking to men while unchaperoned, or very young girls being sold into marriages with much, much older men, or people being slaughtered wholesale for their religious beliefs or simply residing on the wrong side of some imaginary border, and the stupidity and ignorance of things like believing that albinos and virgins cure AIDS (bunch of voodoo nonsense) – it makes me wonder that the human race has the temerity to consider themselves above other animals and that we can call ourselves civilized. I need to read more about Sophie and the reaction of other people to her brave actions. The fact that she was being honored at the University of Munich when we were there speaks volumes about the attitudes of many young Germans today. But, as you say, there is still much ugliness in our world, and likely it will always be so.